Let me announce a new display at Highland featuring the Sculptured Rocking Chair in kit form as presented by Charles Brock. If you recall, last fall and winter I started putting one of these kits together and began shaping the chair. Unfortunately (with apologies to Charles and his suppliers) I got sidetracked with some heavy Habitat activity and the project slipped. For the purposes of preparing an exhibit to put on display at Highland, I decided to finish half the chair and leave the other half in essentially the shape it comes in from the kit. Last week I was able to deliver the chair to the store so the staff could prepare a display for everyone to see and get a feel for the size and scale of the chair. The chair is imposing and I promise you will be impressed with its sensuous shapes, fine curves and subtle details. I also left the patterns which come with the kit, plus the forms I used to make the rockers assume their marvelous compound curve shape, probably my favorite part of the chair. If you have any chance at all, come by the store and get your hands on this chair. With a lot of assistance from Charles, the left side of the chair is shaped and ready to get the final sanding and finish. As a matter of fact, if you buy Charles’ latest DVD on shaping a chair, you will see this very chair as the star of the show. (If you listen closely, you may hear me coughing in the background from the dust.) The chair will be on display at the store for several months and then I will bring it back to my shop and do the hard task of making the right side match the left side. Should be fun!! By the way, if you want to present this chair to someone at Christmas, don’t delay getting your kit. I would hate for you to miss Santa because you are still up on Christmas Eve waiting for the finish to dry. 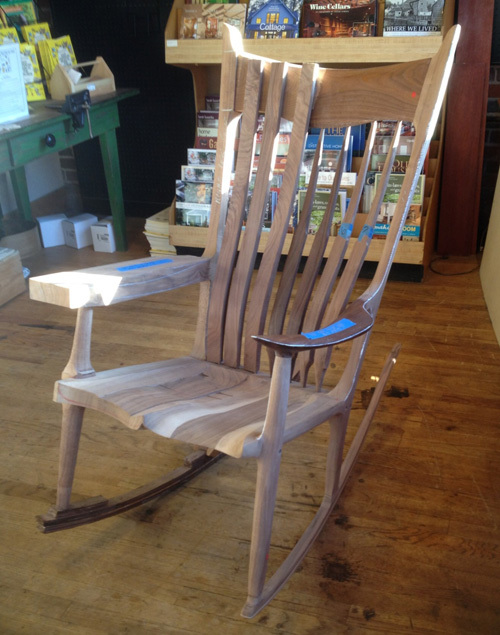 Terry Chapman did a whole series of blog posts on his experience with the Sculptured Rocker Chair kit – if you want, you can start from the beginning of the Sculptured Rocker build blog post series! Comments Off on From the Chair-man: Sculptured Rocker on Display at Highland!